The Duchy of Lancaster is one of two royal duchies (the second being the Duchy of Cornwall) and is held in trust for the Sovereign as a source of income (as the Duchy of Cornwall provides income for The Prince of Wales). 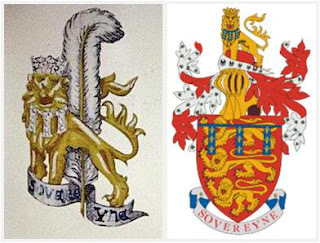 The Dukedom of Lancaster merged with the crown when Henry IV came to the throne in 1399, and the title has remained with the Sovereign ever since. The Queen is the current Duke of Lancaster, and she has a brooch associated with the Duchy of Lancaster coat of arms. The brooch includes a silver feather and a gold lion (with likely diamond accents) standing on a blue banner that reads Sovereyne. She uses the brooch as she uses all her badges (military or organizational), wearing it when visiting the Lancaster area and not incorporating it into her regular decorative brooch rotation.